It’s late, and I should be going to bed soon, but the delightful memories of tonight are making it hard to focus on the lesson plan in front of me. Tonight was the first meeting of our supper club. As I’ve said before, David and I have received an incredible welcome here in Belem. We’re so blessed to have relationships with so many of the missionaries here. There are a few, though, that have been especially welcoming to us. The members of our supper club. Though tonight was our first official meeting, the idea was born last week at a huge table in our tiny kitchen, over peanut butter and jelly sandwiches at 10pm. How delightful it was to laugh with friends even in the midst of an interesting move. 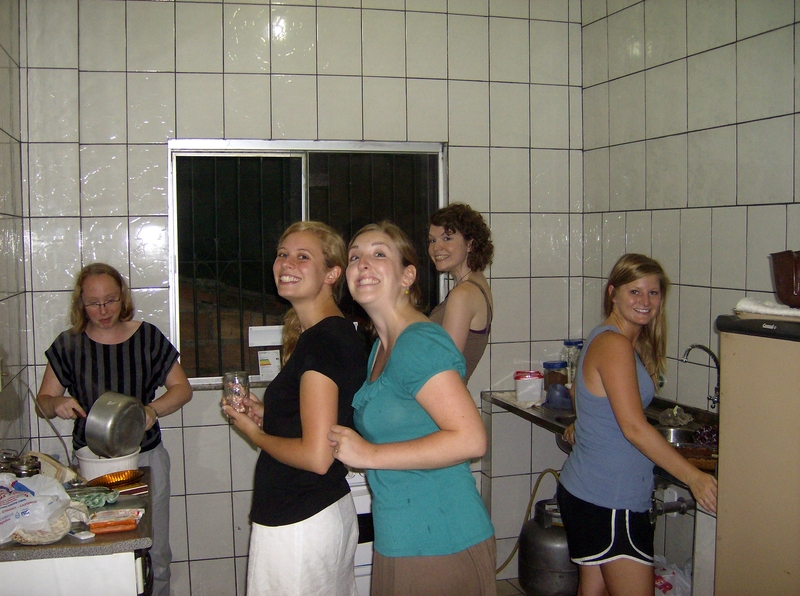 I didn’t realize how different it would be to be a “homemaker” in Brazil. Just a few days later, though, the table has been moved to its rightful place, and our little Brazilian apartment is starting to feel like home. The banana yellow walls look cheerful, and we finally learned how to work our stove. We even have a few large bottles for storing clean water. This evening, as our dear friends packed into the kitchen to finish with the last minute preparations, I quietly thanked God. As we sat around the table, sharing the food we had each prepared, I smiled. As each of us shared about our families and laughed over ridiculous stories, I listened, longing to know more about each person around the table. As we finished off an entire pan of peanut butter chocolate chip cookie bars, I was glad to call these girls my friends. The night was full of conversation and laughter. This echo-y apartment rang with the sounds of laughter as we shared life with one another. We heard how Christie came to know the Lord, we heard about Julia’s family, and Anna told us funny stories from her hometown; we’ve created a place in which we can care for one another. This is exactly what I hoped our home would be…. Turns out it doesn’t matter whether there are curtains on the windows or not. I just cried reading this. I’m so happy that you’ve found a place and people to share life with. love you. Lindsey, I’ve been trying to talk to you, but I don’t get along pretty well with facebook. I get lost sometimes. E-mail me or give me a call whenever you can (84123114).